This week we are reading Peep and Egg: I'm Not Hatching by Laura Gehl and doing chick and egg themed activities! 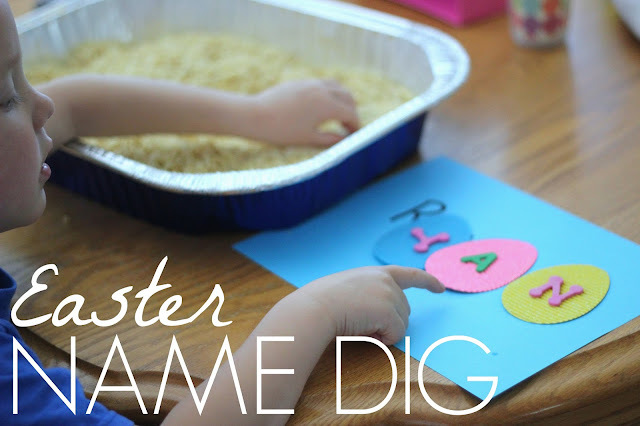 We always love finding simple ways to play with our names, so today we are doing an Easter Egg Name Dig! To set up this activity we started by pouring the rice crispies into the big container. We used an aluminum turkey pan. Next we added letter stickers onto our cardboard and felt eggs. We put the letters in my son's name on the eggs so that each egg had a different letter on it. Next, we wrote my son's name on a piece of colored paper. 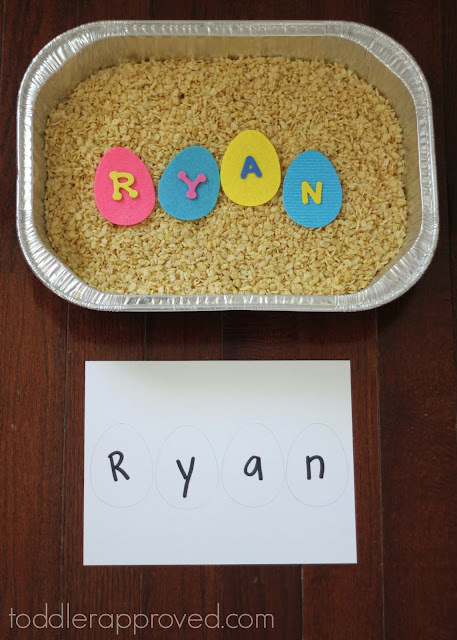 To get started doing the name dig, I buried the eggs in the rice crispies. Then my son dug around in the rice crispies to find each of the eggs and put them in name order on his piece of paper. I had two sets of eggs so we did this activity several times with the different sets. He was thrilled every time he found an egg and loved reminding me which letters they had on them and then spelling his name. Simple activities like this can help kids work on letter recognition, name recognition, and spelling. They also allow for some simple fine motor skills work as kids dig through the rice crispies and carefully place the eggs in the spots where they belong. Since the eggs were different colors, we also talked about the colors that we found while we played. Learning doesn't have to be complicated. This activity is a great way to expose kids to the letters in their name and talk about them. I find that kids love activities that have to do with their names because names are really special to preschoolers. Often I will add in my son's last name to our activities as well because it is really important to him. My son's class at preschool has been working on names for awhile. They build the name, clap it, cheer it, etc. Sometimes when we do simple name activities like this we do that too. Once you're done doing this simple Easter egg name activity, grab Peep and Egg: I'm Not Hatching by Laura Gehl and read it together... and then scroll down to try out some of the other awesome chick and egg activities from our Weekly Virtual Book Club for Kids co-hosts. CHICK & EGG ACTIVITIES FROM OUR CO-HOSTS!